The Four Seasons Place in Kuala Lumpur will open in 2015, sources say. News of a Four Seasons being developed in the capital by two tycoons and a sultan first surfaced in 2005. In 2007, some work even began on the site, but the project has yet to see the light of day. A source told Business Times that some developments can be anticipated within the next three months with completion expected to be three years thereafter. The Four Seasons Place is being built by Venus Assets Sdn Bhd, a firm controlled by Ipoh-born tycoon Ong Beng Seng, Tan Sri Syed Yusof Syed Nasir and the Sultan of Selangor. The delay was attributed to the failure of a proposed deal between Venus Assets and national oil corporation Petronas to go through and the project going back to the drawing board. "The developer is working to ensure this product is worthy of Malaysia's image as an international tourist destination and is in line with the country's target to be a developed nation," the source said. "The project is not being rushed, so that the end result will be a first-class product," he said. Since the plans have gone back to the drawing board, talk is that there may even be a possibility of the Four Seasons reverting to the original plans which included two towers. 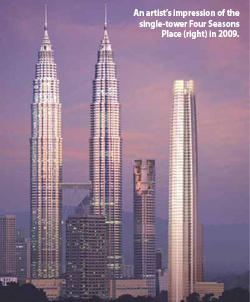 In a 2009 interview with Business Times, Syed Yusof said the building will be a single 65-storey tower. It was to include 150,000 sq ft of retail component, 150 hotel rooms and 100 serviced apartments. Another 140 serviced apartments would be for sale. Venus Assets bought the prime 1.05ha site for RM90 million in 2003 from the estate of the late Khoo Teck Puat, the former major shareholder of Standard Chartered plc. It was reported then that cost of construction for all the components, including land and interior design, was RM1.4 billion and the estimated gross development value (GDV) of the project was RM2.5 billion. Should the new project have two towers, it would be safe to assume that the GDV could be well above the initial estimation of RM2.5 billion.